The more you know about cancer care and what your options are, the more options you’ll have and the more confident you can be in the treatment choices that you are making – and that includes understanding the benefits of getting a PET/CT scan. CTOAM exists to support cancer patients around the globe to access the very best cancer care available, from anywhere in the world, right where you live. Helping cancer patients and their families to be aware of all their options is crucial to our goal of saving lives and improving cancer care for everyone. One choice you have the power to make, at any stage in your diagnosis or treatment, that has soundly proven its benefit to every stage of cancer care, is to get yourself a PET/CT scan. Here’s why. Check out Issue 6 of the CTOAM newsletter to explore the many benefits of PET/CT! Or, read more below. CT scans are a standard part of cancer care because they give doctors more, and different, information about what is going on inside a patient’s body than they could gather just from blood tests and other non-invasive diagnostics. And with cancer, the more information you can have about where it is and how it’s progressing, the better your chances for a long lasting, cancer free life. But CT scans have some significant limitations in contrast to another type of scan that is available in Canada, the PET/CT scan. 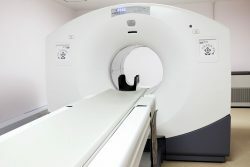 PET/CT scans provide you and your doctor with significantly better insight into your cancer than a CT scan can: Information such as which masses are cancerous and which are not (CT scans cannot differentiate), and a more accurate locating of tumours for more precise surgeries and radiation placement, is provided by PET/CT. However, these scans are rarely recommended by Canadian cancer doctors, due to factors that are completely unrelated to the PET/CTs proven superiority as a diagnostic tool. A PET/CT scan can give you and your cancer care team, including your oncologist, surgeon and radiologist, vital information about your cancer that will benefit every element of your cancer care. And you have the power to ensure you get one! Read on. Discover the BEST imaging for cancer detection and monitoring! How is Cancer Currently Diagnosed in Public Healthcare? Imaging is significant part of the standard diagnostic and treatment process for cancer. Referral to Oncologist for confirmation of diagnosis and treatment plan. 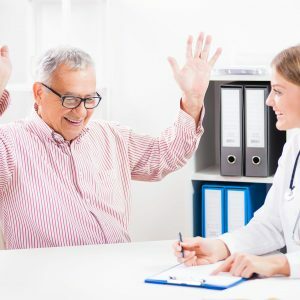 These steps are most often taken by the patient’s GP, as, in most cases, a referral to an oncologist doesn’t take place until cancer is confirmed. So ironically, you could say it’s your GP, and not your oncologist, who needs to understand the most about precision oncology, because they will determine how fast and how precise your initial diagnosis is. And that has a profound impact on every aspect of cancer care. 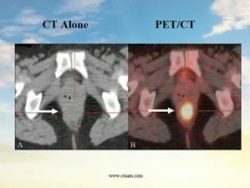 What’s the Difference Between CT and PET/CT? CT scans are used routinely for diagnosis and treatment monitoring in Canada for a number of illnesses. The scan provides your doctor with a 3D image of the inside of the body to detect any abnormalities, such as masses that aren’t supposed to be where they are. A PET scan (Positron Emission Tomography), works in a different way. It shows biological activity at the molecular level and it’s not just telling us something is there, it’s also telling us how active it is. This means that a PET scan can tell us when a mass is benign or malignant, CT scans cannot. A PET scan allows us to detect changes in body tissue before they are visible to a CT scan, thus providing patients with a more precise diagnosis, much earlier than with CT.
A PET/CT scan is a breakthrough for cancer patients because it combines both CT and PET technologies and as such, can show a. where there is a mass AND b. if it is cancerous or not, not just one or the other. This is why PET/CT’s are able to detect cancer in the earliest stages, with greater precision and certainty than CT scans can. PET/CT’s produce highly detailed images of all tumours in your body. They show exactly where the cancer is in your body, which means that your surgery will be more precise and thorough. Radiation therapy based on PET/CT, is more precise too, which reduces the amount of radiation required and leads to a more successful outcome. PET/CT’s can also be used for treatment monitoring, for visible proof that your treatment is working. PET/CT scans are used throughout the world for many types of cancer and are shown to be more accurate in diagnosing cancer than CT scans or PET scans alone. With PET/CT, patients are injected with a radioactive glucose solution. Since cancer cells utilize glucose for their rapid growth, they quickly uptake a significant amount of the solution and glow when imaged. The more aggressive tumours take up more of the solution and glow even brighter. This allows us to identify the exact size and location and aggressiveness of tumours, anywhere in your body. 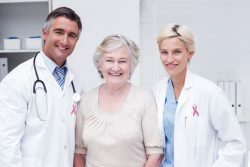 Which in turn gives your doctors much more precise information from which to make their next treatment suggestions, and improves all aspects of your cancer care significantly. It is all well and good to talk about the value of PET/CT in terms of how it helps with cancer diagnosis and treatment, but what about the amount of radiation from the test itself? Can it be harmful? One study from The American Cancer Society indicates the following levels of radiation for X-ray, CT Scan and PET/CT. → A lower GI series using x-rays of the large intestine exposes a person to about 8 mSv, or about the amount a person can expect to naturally be exposed to over about 3 years. *These are estimates for an average-sized adult. Studies have found that the amount of radiation you get can vary a great deal. Some people are reluctant to have a PET/CT scan because they believe that the amount of radiation they will receive could be more harmful to their bodies than the value of the information they’ll miss out on by not having one. Current scientific data shows the old assumptions about how much radiation is safe are wrong. In fact, there is a new understanding among the medical community regarding how the human body absorbs and processes radiation. We now know it that the body is a far more efficient radiation processing machine than we gave it credit for and it can safely absorb more radiation than we had thought. That’s important and reassuring to know! Another benefit of PET/CT is that because of the precision of the PET/CT scan, if a patient is using targeted therapies and liquid biopsies (CT/DNA blood test)) for treatment monitoring, fewer CT scans will be needed for routine monitoring. With PET/CT you will reduce the amount of radiation exposure you receive from CT scans, and reduce the number of extra screening appointments you have to attend, and you’ll have more precise data. Win-Win. Now that we know PET/CT’s are safe, let’s look more deeply at why a PET/CT scan is going to be better than a CT scan for cancer diagnosis and care. Or as we like to say: Where’s the data! CT scans were invented in 1972 and have been in use in Canadian cancer care for many years. Our medical practices, and particularly our cancer diagnostic protocols, have grown around the use of CT scans. Doctors are very familiar with them. We have the infrastructure to provide literally millions of these scans each year. In fact approximately 5.28 Million CT scans were performed in Canada in 2015. That works out to 147 CT scans for every 1000 people versus about 77,000 PET/CT scans, or 2 for every 1000 people. And, whether we wish it did or not, money matters: CT scans are fairly low cost ($700.00 – $2,000.00 CAD, depending on the amount of area of your body you are scanning). 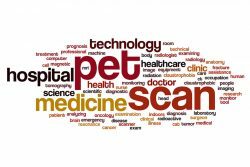 PET/CT, on the other hand, was invented in 2001, and came to market more than 30 years after many millions of dollars had been spent and CT scans had found their place in standard care. Also, even if there were already the same number of PET/CT machines to CT scans in Canada, PET/CT scans would still cost a bit more. This is because PET/CT’s require a sensitive and expensive radioactive isotope to bond with your cancer cells and make them visible. As such, a standard PET/CT will cost ($2,000-$3,500.00 CAD, depending on the facility). In short, this is why PET/CT scans are not offered as part of the standard cancer diagnosis protocol in any province in Canada, at this time. But that doesn’t mean you can’t get one! Read on. For a visual reference of what we’re talking about regarding the difference between CT scans and PET/CT, have a look at the image below. A tumour is completely undetected on the left with a CT scan, but an aggressive tumour is seen when a PET/CT scan is performed. Lives are saved with PET/CT. When determining how well a diagnostic test works, medical science uses two main measurements: Sensitivity and Specificity. → Sensitivity is the number of positives that are correctly identified as such, also called the ‘true positive rate’. → Specificity is the percentage of healthy people who are correctly identified as not having the condition, also called the ‘true negative rate’. 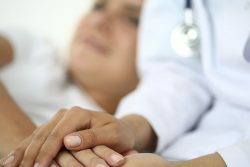 In a 2015 study by The Canadian Agency for Drugs and Technologies in Health, or CADTH, the Canadian national organization that provides research and analysis to healthcare decision-makers, they state that across various cancer types, PET/CT has a sensitivity of 97.4% and specificity of 91.2%, respectively. While, at best, CT scans have a sensitivity of 85.9% and specificity of 67.3% but this number can be significantly lower depending on the cancer type. Also, and perhaps most importantly, there is something very crucial to understand about CT scans. As mentioned above, CT scans work by showing if there is a mass in your body – they do not indicate if it is growing in size, or even live tissue or dead. Therefore, to use CT as a cancer diagnostic tool, your doctor has to use a time-lapse perspective. In other words, to be able to know if the mass is growing, or the same size or smaller, with CT, the current image has to be contrasted to a previous image. This means you will need to have a minimum of 2, and usually 3 CT scans, over a minimum 6 month to two-year period, in order for the doctor to have the perspective to be able to say that you might have cancer. In other words: It takes 3 tests and 6+ months for a doctor using CT scans to tell you what a PET/CT can tell you, and with greater precision and certainty, in one test, in 24 hours. That’s at least 6 months that your cancer won’t have to grow. And that’s 6 months you can be adding other key elements of precision oncology, like genetic testing and targeted therapies and getting the jump on your cancer. → Europe was an early adopter of PET/CT as was the U.K. Studies on the overall value of PET/CT show that it has ‘clearly demonstrated its effectiveness’ over CT scans for cancer diagnosis, and as previously mentioned, in the words of these authors, ‘cost effectiveness has been demonstrated only in part.’ (In other words, it’s a little more expensive than CT). → In 2017, the number of clinical PET and PET/CT scans performed in the U.S. was estimated at 1.945 million. These scans were performed at approximately 2,400 sites. → In contrast, Canadian public health has 45 machines at 34 sites and we perform approximately 63,000 PET/CT scans a year. There are also 7 private PET/CT clinics across Canada and more on the horizon. → This link presents a clinical study, conducted at the Mayo Clinic in 2010 and later that year published in the Journal, Archives of Neurology, which concluded: A combination whole-body PET-CT scan is more accurate than CT in detecting cancer. From this study and many others like it, PET/CT scans became an integral part of standard medical diagnosis around the world. How Come Your Doctor Didn’t Mention A PET/CT? There are a few good reasons your doctor might not have mentioned PET/CT as an option for you. First and foremost, as mentioned, it’s not a part of the standard protocol for cancer diagnosis. Also as mentioned above, it’s such new technology in contrast to CT scans. There are 45 PET/CT machines in Canadian public healthcare, versus 538 CT machines and physicians in Canada literally don’t have the same access to PET/CT for their patients as they do the already well established CT scans. For example, BC is considered a leading Province in Canadian cancer care and they are. Here is a link to BC Cancer Agency’s website for General Practitioners with guidelines for diagnosing cancers. Where do you see PET/CT on the list of steps or options? It certainly doesn’t appear as a recommended first step or second or third. So we can understand why your doctor might not have mentioned it. But now you can have that conversation and bring along a little more information for you both to consider. Why Aren’t PET/CT’s Part of Standard Cancer Care? The short answer is simply that PET/CT’s are new technology and subsequently, they cost more. 5. …and back around to #1. The article linked here, first published in the globe and mail in 2010, addresses these issues, pertaining to CT scans, in further detail if you’d like to know a bit more. In short, we are experiencing the same concerns now, 8 years later, with this new technology. Also, the uptake of PET/CT as a routine procedure for cancer diagnosis would require many 10’s of millions of dollars to pay for the machines themselves; and for new facilities to house the machines; for staffing these new facilities; as well as the cost of the radioactive isotopes required to be shipped in daily for each scan. It’s a dilemma to be sure. But it doesn’t have to be an issue for you if you have cancer. CTOAM is here to make sure you understand your public, and private, health care options for obtaining a PET/CT scan and we’ll help as needed to arrange one for you. By now it should be clear that PET/CT’s have shown enough benefit to the outcome of the lives of cancer patients. You can see, for yourself, why precision oncology specialists use PET/CT scans. And for the use of targeted therapies, which is another key element in precision oncology, they simply produce a much better image for your surgeon to take a biopsy from. 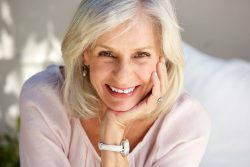 The better your biopsy the more successful the follow up diagnostic testing can be and that means, the better the likelihood of finding all possible treatment options available to you. How precise do you want your treatment to be? The data is clear that PET/CT makes a positive difference in all aspects of cancer care. If you’d like more information on PET/CT versus CT scans, see our PET/CT vs CT comparison to learn more. And, if you would like a second opinion to make sure you’re headed in the right direction in any aspect of your cancer care, contact us for our free consultation and we’ll find out a bit about you and share some ideas for things to consider. You deserve the peace of mind to know definitively whether you have cancer or not – and to have confidence you know about all your treatment options. If you’d like us to help arrange for you to get a PET/CT scan, or have any questions about the process, or anything else to do with cancer, please contact us today. Let us help you take the next step with confidence. Get a PET/CT Scan Quickly, Easily, and Affordably! In 2006, Margaret was diagnosed with breast cancer. She had surgery shortly after diagnosis, then multiple rounds of chemotherapy and radiation through the BCCA (British Columbia Cancer Agency). Afterward, she had a reprieve from breast cancer for seven years, during which time she was on hormone replacement therapy for five years. Then the disease reared its ugly head once again – only this time it was worse. Margaret found she wasn’t tolerating the radiation treatment like she had the first time around. Her BCCA oncologist found a drug for her, but it came with a condition: she gave her a timeline of two years, after which, it would likely stop working. 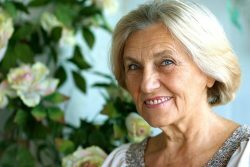 As the clock ticked by, Margaret lived her life to the fullest, waiting patiently for a sign and continuing to explore options. One day, while out to lunch at a Chinese restaurant with her husband, she opened a fortune cookie that read, “Research shall bring considerable success with great results.” Though Margaret doesn’t believe in fortune cookies, there was something about that message that hit close to her heart. Shortly after that, one of her sisters told her about CTOAM. Can Rigorous Exercise Help Prevent and INHIBIT Cancer? Most of us know that exercise is beneficial for lowering stress, maintaining weight, and increasing energy. 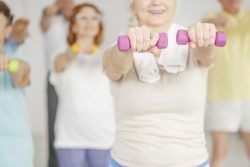 But rigorous exercise and weight training are also proven to helpprevent cancer, as well as slowing the progression and metastasis of cancers. Looking for a good reason to step up your exercise and weightlifting routine? Read on to find out what they are – and then get yourself to the gym!